The Toyota GT86 Open Concept is set to debut next week at the 2013 Geneva Motor Show but thanks to a handful of leaked images, we get an early look at the concept that will preview the Scion FR-S convertible. 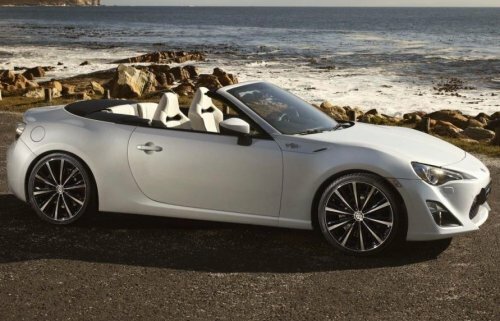 After the images leaked online, Toyota UK issued a press release with more of those same images along with details on the new Toyota GT86 Open Concept, giving us our first official look at the long awaited Toyota convertible. Considering that the GT86 is identical to the Scion FR-S sold here in the United States, this early look at the GT86 Open Concept gives us a great idea of what the FR-S would look like in convertible form. There has been no confirmation that an FR-S convertible is coming but with the high level of enthusiast demand sine the coupe was introduced – a drop top version seems like it is almost a sure thing. Toyota UK stated that this concept has been “created to gauge reaction to possible development of a cabriolet (that’s a convertible to most Americans) version of the GT86 sports coupe” but it is widely believed that the convertible is already set to see production in the near future. Even though the GT86 Open Concept hasn’t seen the light of day in public, we can pretty much assume that the reaction is going to be very positive and that it will cement the future production plans. Once the GT86 Cabriolet is confirmed, we can’t imagine that it will be long before the Scion FR-S and perhaps even the Subaru BRZ arrive in drop top form here in the US. There has been a great deal of speculation that a convertible version of the Toyota GT86 would call upon a supercharged version of the D4S Boxer motor that powers all of the “Toyobaru” sports cars to offer at least a little more power. However, this morning’s official statement from Toyota indicates that the GT86 Open Concept packs the same drivetrain as the production coupe. By modern sports car standards, the 200 horsepower and 151lb-ft of torque produced by the Toyota GT86, the Scion FR-S and the Subaru BRZ is fairly low but these cars still offer impressive performance thanks to a low curb weight. However, when a most coupes are transformed into production convertibles – even with vehicles that are designed as both a coupe and convertible such as the Ford Mustang – the drop top version weighs more than the hard top. Fortunately, the chassis of the Toyota GT86, Scion FR-S and Subaru BRZ was designed with possible convertible duty in the future so cutting the roof off didn’t make much of a difference to the structural integrity of the car. This means that heavy reinforcements weren’t needed so the company was able to keep the curb weight of the GT86 Open Concept down to an impressive 2,771 pounds. The Scion FR-S weighs 2,758 pounds when equipped with a manual transmission while those FR-S sports coupes fitted with the automatic transmission weigh 2,806 pounds. The Toyota UK press release doesn’t make it entirely clear whether that figure of 2,771 pounds is for a vehicle fitted with an automatic or manual transmission but it should be noted that the interior pictures of the GT86 Open Concept clearly has an automatic pedal assembly. Should that weight figure apply to the exact concept car, Toyota may have effectively cut the weight for the automatic versions which would put the manual transmission model somewhere in the area of 2,723 pounds. That being said, I would guess that the quoted weight figure applies to the manual transmission model and should that be the case – it is still pretty impressive that Toyota was able to transform the GT86 coupe into a convertible while only adding about 13 pounds. One thing that you will notice in the images of the Toyota GT86 Open Concept is that shy of the removal of the roof, there really isn’t that big of a change between the coupe and the convertible. Unlike some concept cars that feature ridiculous body additions that are guaranteed to never see production, the GT86 Open Concept has the familiar front and rear fascias with only the large wheels and what looks to be a TRD exhaust system being unique to the convertible concept. Most importantly, the new Toyota GT86 Open Concept has managed to preserve the rear seats so unlike the competition from Mazda or Nissan, the GT86 Convertible has seating for four. The back seats might be a touch short on leg room but when you compare this layout to that of the MX5 or 370Z – those vehicles do not have a rear seat at all so the Toyota drop top will offer more seating and more interior cargo space. The Toyota GT86 Open Concept will formally debut next week at the 2013 Geneva Motor Show and while we have seemingly gotten all of the details in advance, there is always the chance that some new bits of info will arrive with the big debut. Click any of the thumbnails above on the right or below for a closer look at the Toyota GT86 Open Concept. We should do a comparison test of the IS250C and the new FRS Convertible. Yawn.